Building on my last post on stateful-process-command-executor this post will cover how you can leverage that node.js module to expose the capabilities of Powershell cmdlets over a REST api presented through an AngularJS interface. Why would one want to do this you ask? Well I’ve covered this in my last post but I will briefly explain it here. The use case came out of the need to automate certain calls to manage various objects within Microsoft o365’s environment. Unfortunately Microsoft’s GraphAPI, does not expose all of the functionality that is available via its suite of various Powershell cmdlets for o365 services. Secondly when you need to do these operations via Powershell, its requires a per-established remote PSSession to o365…. and establishing (and tearing down) a new remote PSSession whenever you need to invoke a cmdlet against a remote resource (remote server, or o365 endpoint) is expensive. Lastly, who wants to actually sit there and manually run these commands when they could be automated and invoked on demand via other means… such as via a web-service etc. Hence this is how stateful-process-command-proxy came to be… it provides the building block bridge between node.js and a pool of pre-established Powershell consoles. Once you have node.js talking to stateful-process-command-proxy, you can build whatever you want on top of that in node.js to mediate the calls. So the main thing to understand is that the module provides the PSCommandService class which takes a registry of pre-defined “named” commands and respective permissible arguments. The registry is nothing more than a object full of configuration and is easy to define. You can see an example here in the project which defines a bunch of named “commands” and their arguments usable for o365 to manipulate users, groups etc. 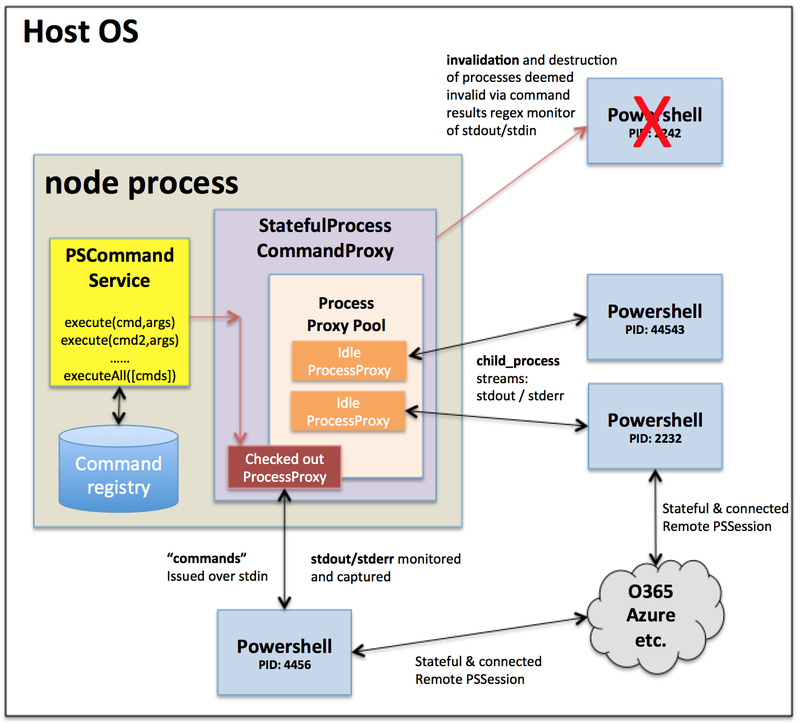 PSCommandService is intended to serve as a decoupling point between the caller and the StatefulProcessCommandProxy… in other words a place where you can restrict and limit the types of commands, and arguments (sanitized) that can ever reach the Powershell processes that are pooled within StatefulProcessCommandProxy. 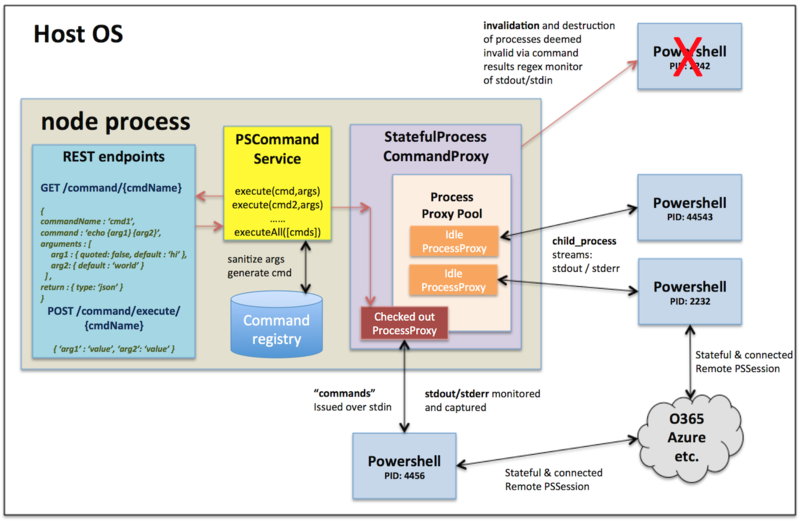 It is PSCommandService‘s responsibility to lookup the named command you want to execute, sanitize the arguments and generate a literal Powershell command string that is then sent to the StatefulProcessCommandProxy to be execute. StatefulProcessCommandProxy, once the command is received is responsible for checking that the command passes its command whitelist and blacklist before executing it. The sample o365Utils.js config file provides a set of pre-canned (usable) examples of init/destroy commands, auto-invalidation commands and whitelist/blacklist configs that you can use when constructing the StatefulProcessCommandProxy that the PSCommandService will use internally. The next logic step is to expose some sort of access to invoking these pre-canned “commands” to callers. One way to do this is via exposing it via a web-service. WARNING: doing such a thing, without much thought can expose you to serious security risks. You need to really think about how you will secure access to this layer, the types of commands you expose, your argument sanitiziation and filtering of permissible commands via whitelists and blacklists etc for injection protection. Another precaution you may want to take is running it only on Localhost for experimental purposes only. 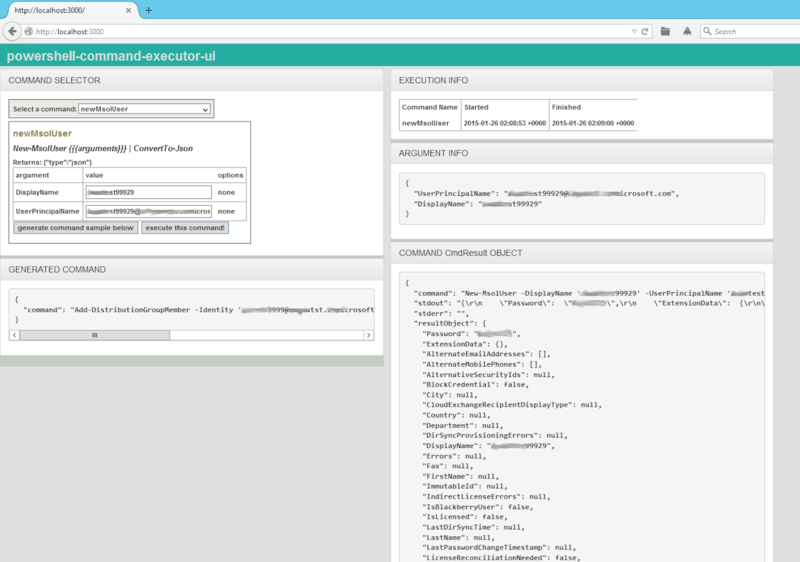 READ OWASPs article on command injection. Given the above set of services, one can easily build a user-interface which dynamically lets the user invoke any command in the registry and see the results… and this is exactly what this project does via an AngularJS interface (albeit a bit crude…). See diagrams below. Hopefully this will be useful to others out there, enjoy.